This is one of those movies I knew I wanted to see, but was willing to wait for it to come out on DVD. One reason I wanted to wait was because I was hoping that there would be some DVD extras with footage of the real Secretariat. But I was disappointed to find that there weren’t any DVD extras. This movie was directed by Randall Wallace. Randall wrote the screenplay for Braveheart. He has some other impressive credits, including the screenplay for Pearl Harbor and writing and directing of We were Soldiers. He’s someone whose work I would be interested in solely because of his involvement. The guy knows how to tell a story. This film had a number of obstacles to overcome. One, even though Seabiscuit was released several years ago, this film was sure to be compared to that other horse racing film. Two, the real story of Secretariat didn’t have the kind of conflict you need to drive a narrative. So the filmmakers decided to invent their own conflict. They failed to mention that Secretariat had already won the Derby in 1972, the year before the triple crown. They invented financial jeopardy where none existed. And they added scenes that took me completely out of the story and made me think of what was going on the day they filmed it. Those criticisms aside, I still enjoyed the movie. It was entertaining. Diane Lane had a fine performance. When I looked up the film details on Blockbuster.com it had Secretariat starring Dylan Walsh. Dylan plays the father of Diane’s character, Penny Chenery, and he’s mostly catatonic for most of the movie. So I don’t see where that came from. John Malcolvich who plays the trainer seemed miscast to me. I didn’t see Secretariat’s trainer, I saw John Malcolvich playing the role of trainer. So all in all this is worth renting. It would have gotten a better rating if they would have taken the time to add some extras. But since they didn’t, I’ll take the time to add one of my own. I was sixteen years old when Secretariat won the triple crown. So I remember it (kind of). But there is also a six degrees of separation connection be between me and Secretariat. I wrote a book about an airliner that ditched the Caribbean Sea on May 2, 1970. That day happened to be the same day as the ninety-sixth running of the Kentucky Derby. Secretariat was just over a month old at that time. Three years later as Secretariat was making history, the same airline that was involved in the ditching happened to transport Secretariat in one of their planes. 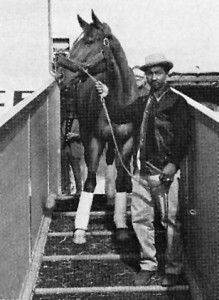 This picture is of the horse and one of the trainers, who is portrayed in the film, getting ready to load Secretariat on to the plane.